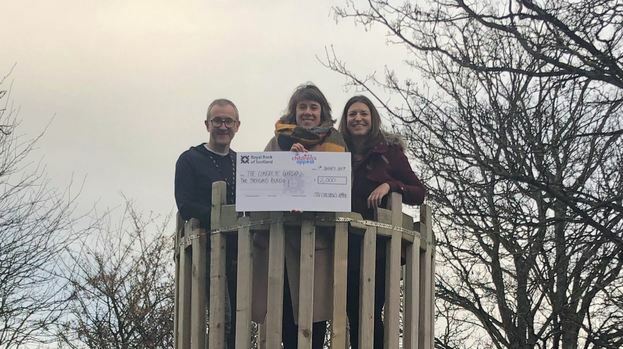 Picture shows: Liz Adams from The Concrete Garden (middle) with STV employees Michael Curran and Katie Martin, who visited the project to find out how the funding will benefit staff and children. The Concrete Garden provides outdoor play sessions for children in its two gardens and natural play area, allowing children to grow vegetables, cook, eat, play and learn together. Liz Adams, Children and Families Development Worker at The Concrete Garden, said: "Many of the children who visit The Concrete Garden don't often get the chance to climb trees, invent new games, sit around a camp fire and just be kids. This funding from the STV Children's Appeal will help give them that opportunity."